You’ve got questions, so we’ve prepared answers. These are the most common questions that people ask. However, if you don’t find what you’re looking for please contact us. Who are my customers for parking lot litter cleanup? What types of properties could I be contracted? Shopping plazas, office buildings and warehouse sites. The largest of each is typically done “in-house”, meaning they have their own people, usually on-site. These malls, office towers and warehouse parks are likely concentrated in certain areas. There are far more small to medium sized properties of each type. Because they are everywhere, the litter cleanup is usually contracted out. These smaller properties can easily be covered by foot in only a matter of minutes. This your market. Parking lot litter cleanup is an after hours service. This simply means the work is done after the stores have closed and there are no vehicles parked and in your way. These hours won’t interfere with your present employment so there’s no need to quit your job. Are the job sites dark at night? No! As a matter of security there’s plenty of light from sources such as store signage, parking lot lights and even street lights. It snows where I live. 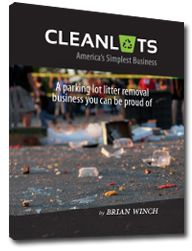 Is parking lot litter cleanup a seasonal business? This service is provided year round. Litter must be cleaned up whether it’s on a dry surface or on snow. I’ve seen sweepers/vacuum trucks cleaning parking lots. How do I compete with them? It’s an entirely different service. Power sweeping is a less frequent service done to remove dirt and sand from the lot. Obviously, any litter will also be swept up. Parking lot litter cleanup is most often a daily service whereby litter is cleaned up from the entire property – lot, sidewalks and landscape. Using just simple hand tools you provide an “after hours” service that saves your customers money while providing for cleaner properties. No. Once you have acquired my knowledge it will be yours forever. The same principle applies when you receive a college degree. You can’t give the education you received back to the school. You are receiving very specialized information at a truly affordable price that can make you many times your investment. What is the initial cost of supplies to get started? Most people have some equipment such as a broom and trash bags. A special litter scoop tool can be found at your local cleaning supplies store for less than $50.00. If this business is so good, why share it with anyone? This business is strictly local. I couldn’t operate in your city just as you couldn’t in mine. The truth is, I have nothing to lose by teaching you what I know and much more to gain by “letting” you in on my secrets – which will be to our mutual benefit. It becomes a win/win situation for the both of us! I’ve never been in business for myself before. Can I do this? You don’t need any business background or even a high school education to do this – I barely graduated, didn’t go to college. It’s perfect for students, retirees or any able-bodied working person looking to get ahead. Enjoy the freedom of being your own boss. YOU decide when and how many hours you work. YOU keep all the money you earn. YOU control your financial future!